RODA® Agricultural Machinery Makers, Public Work, Forestry Machinery and Road Cleaning since 1920. RODA® it will be present at Sant Miquel Agricultural Trade Fair, National Agricultural Machinery Exhibition, from 28 to 30 September, 2018. RODA® will be present at MUNICIPALIA, International Municipal Equipment and Services Exhibition from 24 to 26 October, 2017. RODA® it will be present at Sant Miquel Agricultural Trade Fair, National Agricultural Machinery Exhibition, from 28 September to 1 October, 2017. Trade Fair in Sant Josep de Mollerussa on 17 to 19 March, 2017. Exterior Area, Sector B (Avenida del canal) Plot 36. RODA® it will be present at Sant Miquel Agricultural Trade Fair, National Agricultural Machinery Exhibition, from 29 September to 2 October, 2016. Trade Fair in Sant Josep de Mollerussa on 17 to 20 March, 2016. Exterior Area, Sector B (Avenida del canal) Plot 34. RODA® MAQUINARIA AGRICOLA will be present at FIMA, International Agricultural Machinery Trade Fair, from 16 to 20 February, 2016. Hall 4 Stand A 17/19. New Sweeper ECO VIAL model for 4x4 and Pick up to a attach to the vehicle. Ideal for small towns, parking lots, industrial estates, highways, etc. RODA® will be present at MUNICIPALIA, International Municipal Equipment and Services Exhibition from 13 to 16 October, 2015. 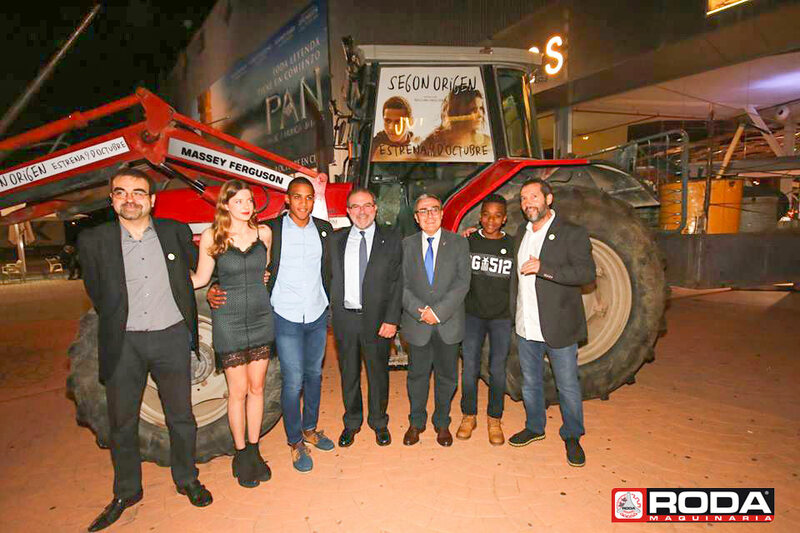 FRONT LOADER RODA in the new film SEGON ORIGEN of Bigas Luna and Carles Porta directors. The premier will be the 9th October 2015 in the Sitges Film Festival - Barcelona. RODA® it will be present at Sant Miquel Agricultural Trade Fair, National Agricultural Machinery Exhibition, from 24 to 27 September, 2015. Trade Fair in Sant Josep de Mollerussa on 19 to 22 March, 2015. Trade Fair in Sant Josep de Mollerussa on 20 March, 2014. Exterior Area, Sector B (Avenida del canal) Plot 32. RODA® MAQUINARIA AGRICOLA will be present at FIMA, International Agricultural Machinery Trade Fair, from 11 to 15 February, 2014. Hall No. 4 Stand 013. RODA® will be present at MUNICIPALIA, International Municipal Equipment and Services Exhibition from 22 to 25 October, 2013. RODA® it will be present at Sant Miquel Agricultural Trade Fair, National Agricultural Machinery Exhibition, from 26 to 29 September, 2013. Trade Fair in Sant Josep de Mollerussa from 16 to 19 March, 2013 Exterior Area, Sector B (Avenida del Canal) Plot 32. RODA® will be present at Mora de la Nova Trade Fair, from 25 to 29 October, 2012. RODA® will be present at Sant Miquel Agricultural Trade Fair, National Agricultural Machinery Exhibition, from 27 to 30 September, 2012. New CR70EX Wood Fuelled Heating Boiler ideal for outdoors when there is lack of space in the interior of your home. RODA® Presenting the New Range of Vibrating tools and collecting umbrellas for almonds, olives and Nuts installed in all loaders and tractors. New RODA® Forklift Visión Total, with double cylinder for all kind of tractors. New RODA® Wood Fuelled Heating Boiler with great loading inlet and great capacity water trap. RODA® MAQUINARIA AGRICOLA will be present at FIMA, Agricultural Machinery International Trade Fair from 14 to 18 February, 2012. Hall 4 plot 013. At FIMA we will present the New Forklift model DUPLEX 2,000 Kg, loaders, Snowplows, Sweepers, Wood chippers, Bioshredders, Backhoes and Trailers. RODA® GOES IN FRONT! We will be waiting for you all. RODA® will be present at MUNICIPALIA, International Municipal Equipment and Services Exhibition from 18 to 21 October, 2011. RODA® will be present at Sant Miquel Agricultural Fair, Agricultural Machinery National Exhibition from September 29th to October 2nd, 2011. New "ECO AGRI" Sweeper for artificial turf. 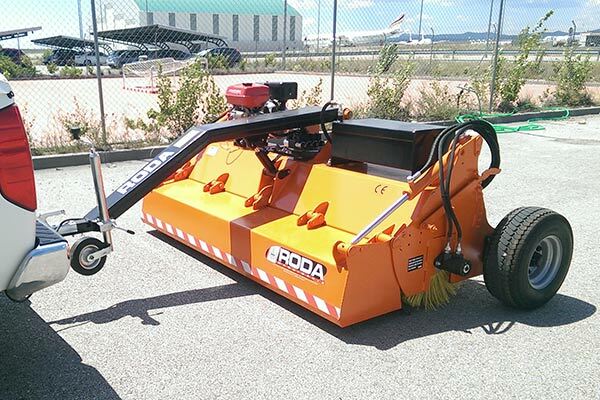 RODA® presents a New Sweeper for artificial turf. 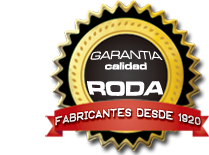 RODA® in constant innovation and searching for different needs of the customers. RODA® presenting its new loader MAX-TITAN model with Hydraulic Parallelogram at Sant Josep de Mollerussa Trade Fair. Trade Fair in Sant Josep de Mollerussa from 18 to 20 March, 2011. Outside Area Sector B (Avenida del Canal) Plot 36.